Let’s face it: with certain dogs, it’s quite difficult to tell a female dog and a male dog apart. Unless the dog is wearing a distinctive blue or pink collar that says “boy” or “girl” all over it, in many cases, you may need to take a quick and discreet peak down there just to “verify” or you may simply use the easy way out and ask the owner directly. However, in certain dog breeds the physical differences between male and females are more noticeable, so much so, that even in their breed standards, female dogs are often described as appearing more “feminine” compared to the male dog counterparts. The condition where there are differences between two sexes within a species, that go beyond the appearance of their sexual organs, is known as “sexual dimorphism.” Size, color, markings are often the most distinguishing secondary sexual features. Sexual dimorphism is often seen in birds (think difference between male peacock and female), insects and plants, while in dogs, it seems to be more prevalent in certain dog breeds compared to others. According to veterinarian Dr. Bonnie V. G Beaver, physical differences between male and female dogs starts when dogs are still in the womb. Male dogs are exposed to a testosterone surge which generates male characteristics, therefore puppies not exposed to this surge will be females. Sexually dimorphic differences are quite subtle in young puppies but tend to become more noticeable after the onset of puberty. After all, doesn’t that happens in humans well? How many times are baby boys and baby girls confused for one another? 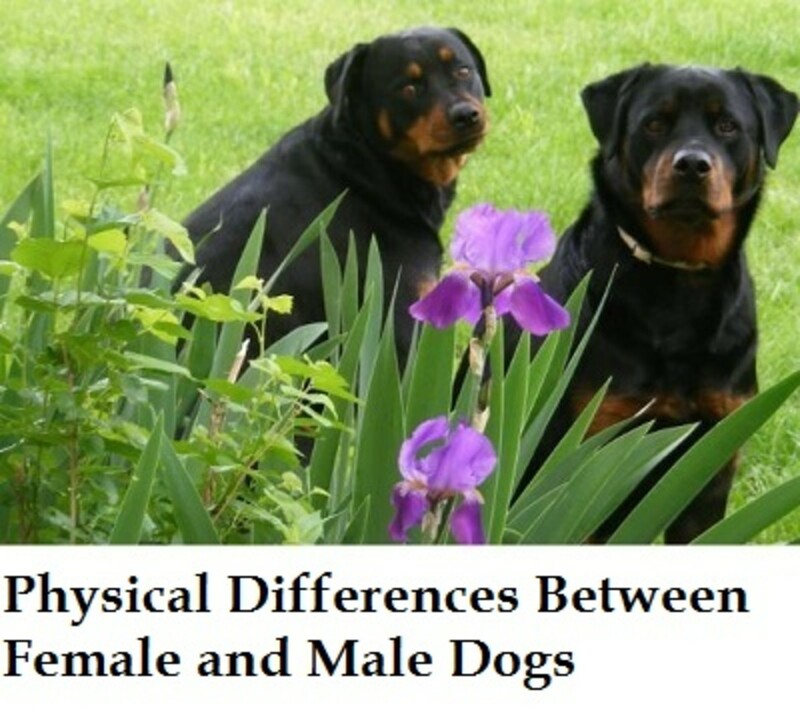 So next, let’s take a look at four common physical differences between male and female dogs. 1) What a Big Dog You Are! In most dog breeds where sexual dimorphism is present, size (sexual size dimorphism) is the most striking distinguishing feature between male and female dogs. There’s an interesting phenomenon worth mentioning that’s called”Rensch’s Rule” which was named after Bernard Rensch, who first described it in 1950. Basically, according to the rule, when the male is larger within a dog breed, the female is respectively smaller. This difference is more prevalent in the larger breeds while in the smaller breeds, there appears to be less variability. There are several examples of sexual size dimorphism in dogs. For instance, the American Kennel Club Rottweiler breed standard states that male dogs are more massive throughout, have a larger frame and a heavier bone structure. Male Rottweilers are expected to reach 24 to 27 inches at the withers. Females on the other hand, are described as being distinctly feminine and reaching 22 to 25 inches at the withers. In a study, smaller dog breeds like Chihuahuas, Prague ratters, papillons and miniature spitz showed less significant differences in shoulder height. And of course, with height comes weight, so male dogs are often weighing more than females. 2) What a Big Head You Have! Other than size, the shape of the head is often a distinguishing factor when it comes to physical differences between male dogs and female dogs. Male dogs of certain breeds may have a blockier head, while females have smaller heads with more delicate, refined features. 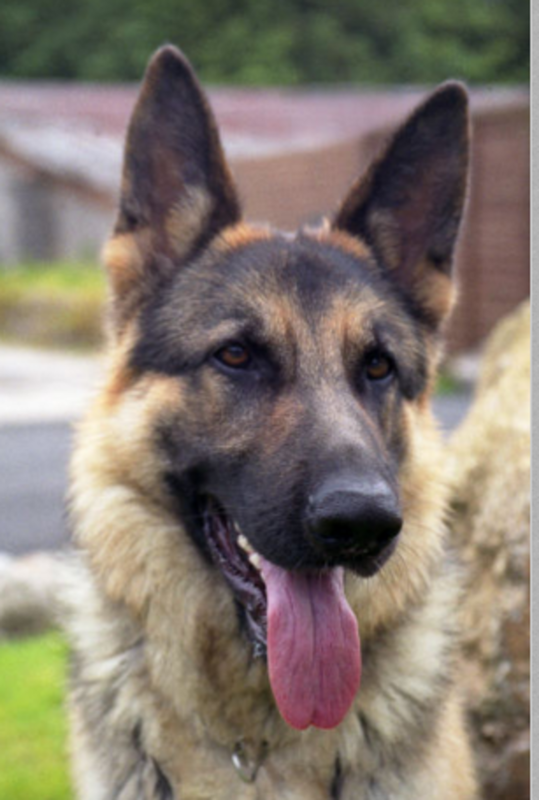 For example, in the German shepherd dog breed, the head is expected to be more masculine looking in males while in females it’s expected to be more feminine. 3) What a Long Back You Have! 4) What a Nice Coat You Have! In many birds, males often have a more strikingly appearing plumage showing more distinct colors compared to females. Just think about turkeys: male turkeys are significantly bigger and their plumage is more impressive. In dogs, male dogs sometimes have a more luxurious coat that is more evident in long-haired breeds. For example, in the Belgian Tervuren, males are described as having long and abundant hair around their neck, while females rarely have a coat that is as long and ornamented as the male. Did you know? Dogs show more physical diversity than any other species and this is attributed to the fact that they were selectively bred and therefore underwent strong artificial selection. As mentioned, some dog breeds are more prone to show secondary sexual features compared to others. This is just a small list of the many dog breeds with males and females generally showing differences. Of course, there are many more! Years of elective breeding and adherence to breed standards has made these differences more pronounced. 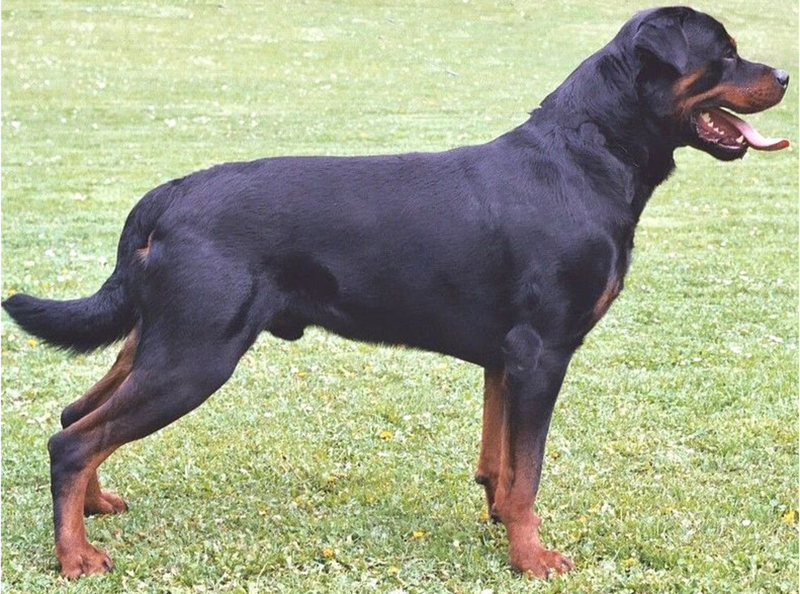 Rottweiler: Male Rottweilers are more massive, have heavier bone structure and a larger frame, while females are distinctly feminine, but without any weakness of substance or structure. Bernese Mountain Dog: The American Kennel Club standard reports males appearing masculine, while female dogs are distinctly feminine. 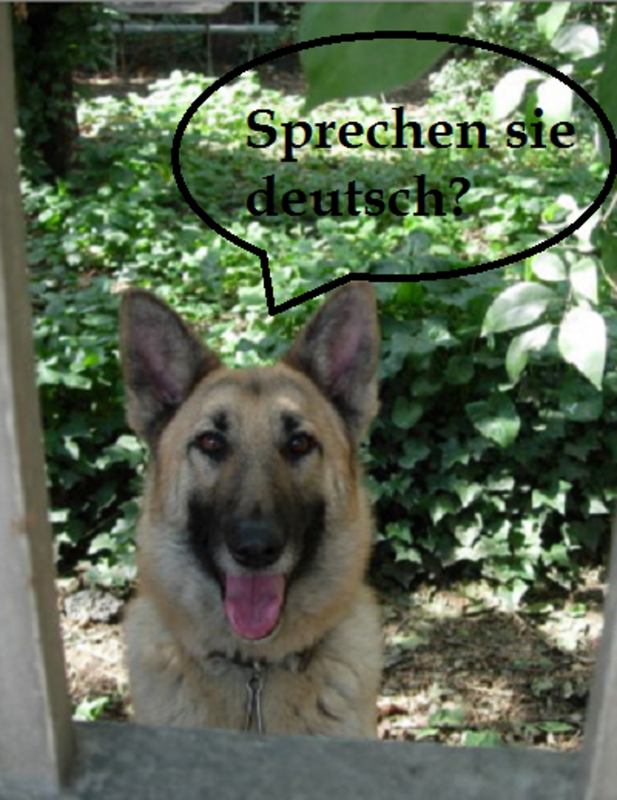 German shepherd: According to American Kennel Club standard, secondary sexual characteristics between male and female German shepherd dogs are strongly marked. The male head is distinctly masculine, and that female is distinctly feminine. Shiba Inu: According to breed standard, male dogs and female dogs are distinctly different with male dogs appearing more masculine without coarseness, and females appearing more feminine but without showing any weakness of structure. English Setter: Male English setters are described by the American Kennel Club standard as being decidedly masculine but without coarseness. Female dogs, on the other hand, are decidedly feminine but without over-refinement. Norrbottenspets: According to AKC breed standard, sexual dimorphism is clearly apparent in Norrbottenspet and a distinguishing factor is the structure of the head. Also, when it comes to proportions, male dogs are slightly rectangular while female dogs are a little longer. Samoyed: According to standard, male Samoyed dogs are masculine in appearance while female dogs are feminine, slightly longer in back, but shouldn’t show weakness of structure. Belgian Tervuren: the standard describes the male dog as appearing unquestionably masculine; while the female should have a distinctly feminine look. Female specimens should be judged equally with the male. Mastiff: according to standard, male mastiff dogs are more massive while females are smaller but still having a proportionally powerful structure. Belgian Malinois: The male in this dog breed has a more impressive appearance while females have a distinctly feminine look.